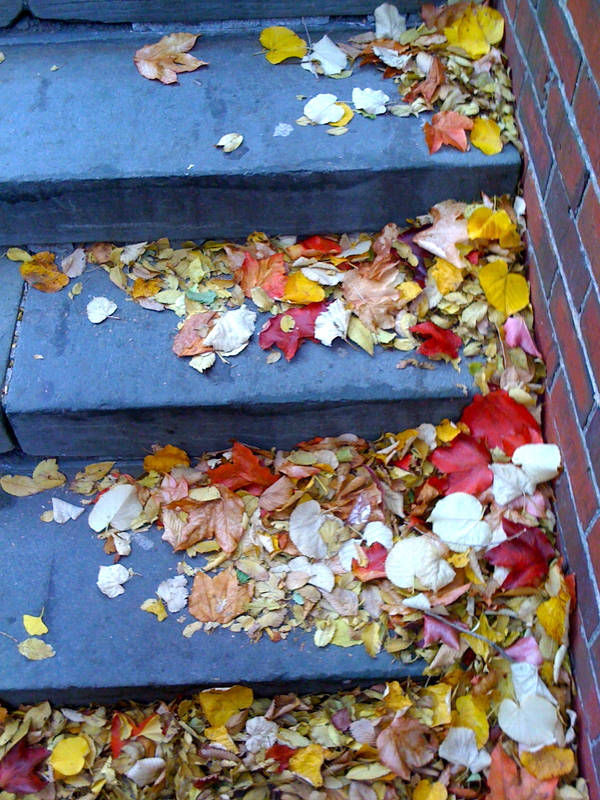 It’s my first fall in New York, and people, I’m blown away. 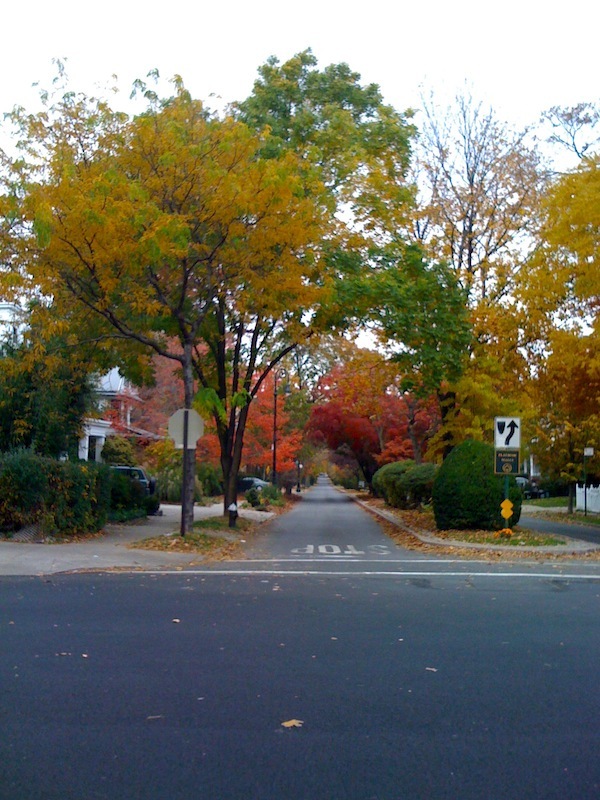 The trees are decked out in palettes of reds ranging from subdued and tawny to alarmingly electric. Bright yellows, pale pinks- the colors are breathtaking. 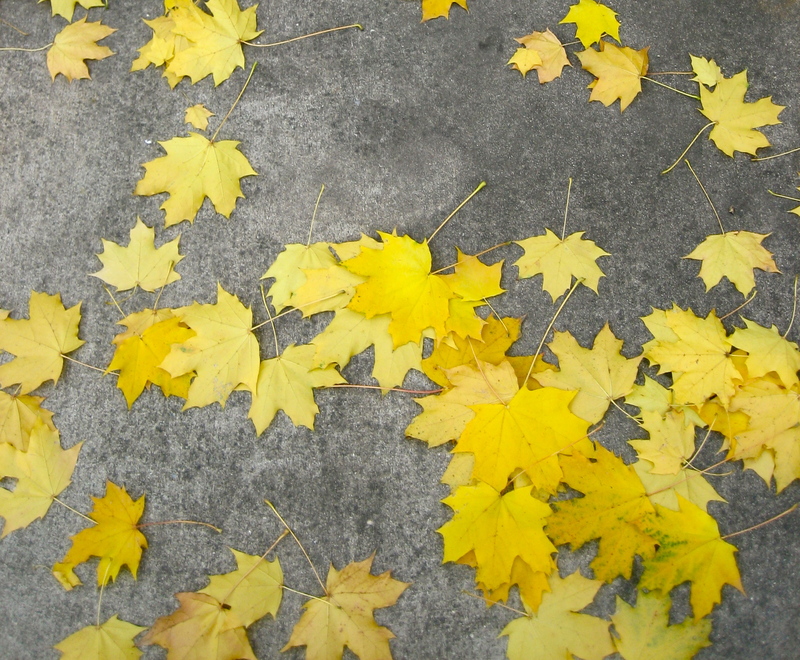 Leaves dangle precariously from branches; the streets are strewn with confetti. The sky is heavy, on the verge of rain- the weather turns quickly from cloudy to rain pelting the concrete. 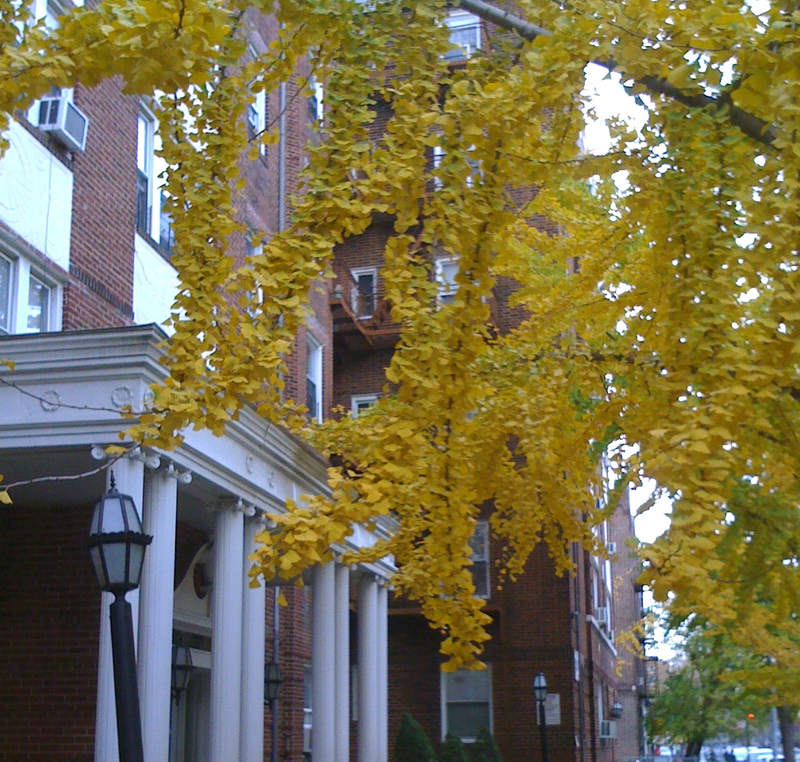 The streets are quiet, after the noisy exuberance of summer, and everything feels slightly hushed, almost in limbo. Although there’s something to be said for every season- the glee of summer, the coziness of winter, the magic of spring- I think fall in New York may just be my favorite. Their bubbling enthusiasm made our home feel magical. Anyways, about that pie.The maple syrup gives the pie a nice, complex, heady flavor, layered and woodsy- almost masculine. Now, it’s not that there’s so much actual elbow-grease involved, all of the components come together with a gentle stir, or a quick whizz in the food processor. BUT. You make the dough, and chill it, roll it out, and chill it, bake it and cool it. Make the syrup and cool it, roast the nuts, and cool them, bake the pie and cool it. I got just a little bit antsy. 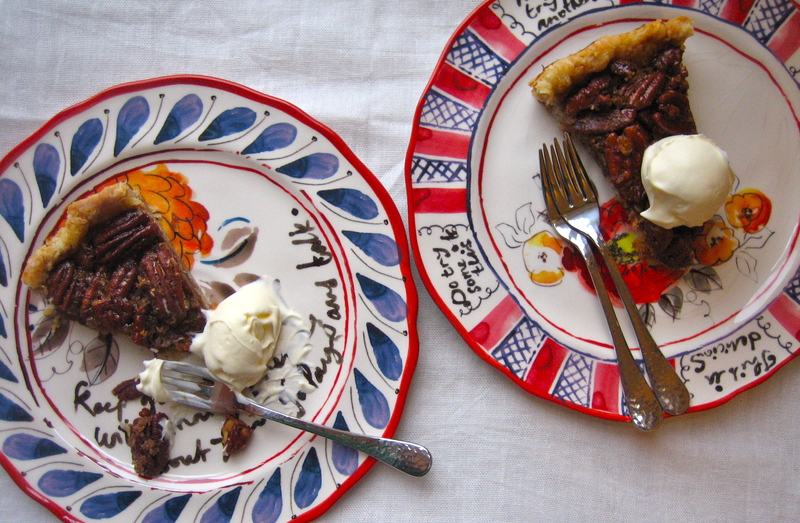 I chose this pie out of the vast numbers of pecan pies out there, because it has maple syrup instead of corn syrup, and I was intrigued by the star anise. After attempting to hunt down the latter at three different stores, with no success, I ended up leaving it out and added lemon zest to the filling instead. There’s a lot of cooling time involved; so although this doesn’t require a lot of hands-on labor, be sure you have a chunk of time. 1. Make the crust: In a food processor, briefly pulse together the flour and salt. Add the butter, and pulse until the mixture forms lima bean-sized pieces (three to five 1-second pulses). Add ice water one tablespoon at a time, and pulse until the mixture is just moist enough to hold together. Form the dough into a ball, wrap with plastic, and flatten it into a disc. Refrigerate for at least one hour (or up to one week, or freeze up to 4 months). 2. On a lightly floured surface, roll out the piecrust to a 12-inch circle. 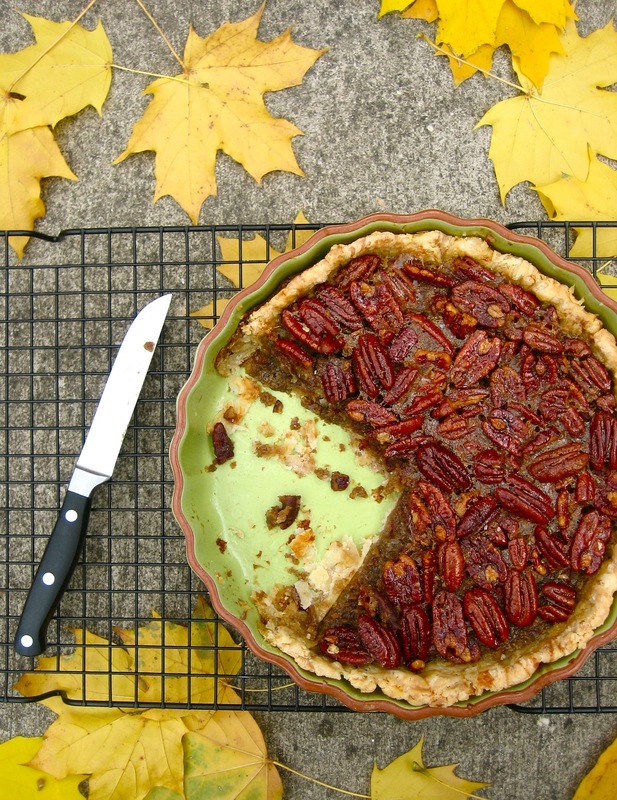 Transfer the crust to a 9-inch pie plate. Fold over any excess dough, and crimp decoratively. 3. Prick the crust all over with a fork, and freeze for 15 minutes (or refrigerate for 30 minutes). Preheat the oven to 400F. Cover the pie with aluminium foil, and fill with pie weights (or pennies, rice, or dried beans). Bake for 20 minutes; remove foil and weights, and bake until golden, about 5 minutes more. Cool on a rack. 4. For the filling: In a medium saucepan over medium-high heat, bring the maple syrup, sugar, and star anise to a boil. Reduce to a simmer and cook until the mixture is very thick, all the sugar has dissolved, and the syrup measures 1 cup, approximately 15-20 minutes (mine took much longer). Remove from heat and let sit for 1 hour to allow the star anise to infuse. 5. Meanwhile, toast the nuts. Preheat the oven to 325F. Spread the pecans out on a baking sheet and toast them in the oven until they start to smell nutty, about 12 minutes. Transfer to a wire rack to cool. 6. Preheat the oven to 325F. Remove the star anise from the syrup. If necessary, warm the syrup to make it pourable but not hot. Do not stir the syrup as you reheat it, as it may crystallize and harden. In a medium bowl, whisk together the syrup, eggs, melted butter, rum, and salt. Fold in the pecan halves. Pour the filling into the crust and transfer to a rimmed baking sheet. Bake until the pie is firm to the touch, but jiggles slightly when moved, about 35-40 minutes. Serve at room temperature with dollops of whipped creme fraiche. P.S. Guys, do you want Thanksgiving ideas? I feel like the internet is just brimming with menus and lists and roundups (here’s a gluten-free one), so I’m a little hesitant to do yet another recap here. If you want one though, I’ll be more than happy to. Just holler. P.P.S. Here’s a useful seven-day plan for Thanksgiving, outlining things that can be made ahead to avoid day-of panic, courtesy of Melissa Clark. The photos of the leaves are amazing! Interesting…..You have given me food for thought! 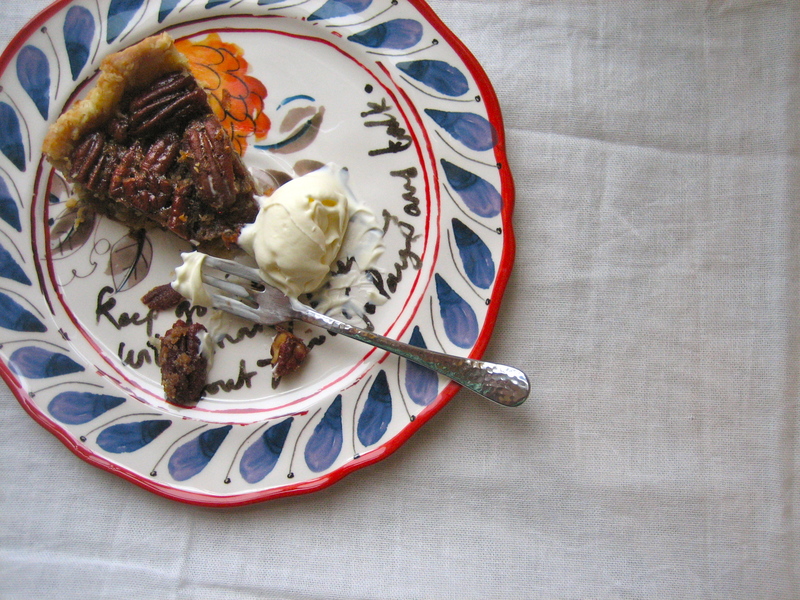 I have made a classic pecan pie for years, I use bourbon not rum, but star anise?!?!! I never would have considered it but now that you mention it….I will have to ponder that for awhile. I recently used star anise in a pear poaching liquid and it was wonderful. Thank you! I thought the star anise was intriguing as well, although I didn’t end up tracking any down in time for this pie… Let us know if you make this, or try adding star anise to your classic pie!